The theme this time around is "From an Ant's Perspective"...which got me quite a few "Get back inside the house already...you're on Ambien!" admonistions from my son. But...I'm sure Ansel Adams was told many times to get his arse back inside...so I persevered. Here is the list of the other "non-contestants" who have probably risen against adversity and braved public ridicule for that one special shot, too: MikeWJ, Nicky and Mike, Mo, Meleah, John, aka nonamedufus, Bryan, aka Unfinished Person, Malisa, Nora, LaughingMom, Tanya, Elizabeth A., 00dozo, Cheryl and Kristen. Getting down on the ground to get an ant's eye view was the easy part...the hard part was trying to hold the camera steady with one hand and estimating how it might look without really seeing it and then hoping an ant graces the magnifying glass...all whilst knowing my crappy camera can only hold a charge long enough to take about four or five shots. Then you have to factor in I'm also heavily whacked out on Ambien and teetering on the edge of my swimming pool waiting for the clouds to break so I can get the "burn the human" take on the ant's perspective. While no ants were harmed in the taking of this photograph, I was bit on the hand twice. I now have a whole new respect for those National Geographic "lying in wait" photographers...but I also respectfully decline any invitations to the Serengeti. Thanks for enlarging my knowledge about ants. Your pic is most illuminating. So is the little dude now scorched into oblivion by the side of your pool? Well done! Very well done! Funny, I tried to get the other perspective, too, but the sun was too bright and I didn't want to fry my eyeballs. But, hey, this works. Good shot! I can't believe you went through all of that and risked searing your eyeballs for this shot. You win the bravest photographer award right here and now. I love it! 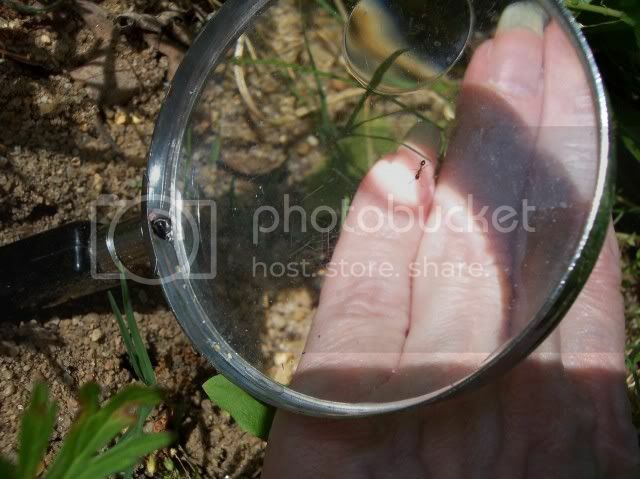 It's like the ant is inspecting your hand more closely though the magnifying glass, perspective indeed! Nope - I didn't scorch even one of them. I might have annoyed them immensely by sticking the handle of the magnifying glass into their anthills...but other than that...they were fine. I probably could have seared my flesh straight thru and never knew about it until after I awoke from my Ambien coma, too. I remember washing my hands off over and over as the bites from Fire Ants really tend to hurt. Get the ant off of your finger before you burn the ant! I am SO DANG HAPPY to have found another Ambien buddy! Woo Hoo! The ant wasn't ON my finger - it was on top of the magnifying glass - so no chance of it getting burned...just me. I have no clue where I put the magnifying glass - Ambien will do that to you. One ant bite and I would've moved on. You're a brave and foolish woman, Mariann. Oh this is great! Love the reverse roles. Yes, I am a foolish woman. I have proof of that for a long while, Mike. 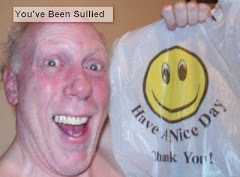 You should change the name of your blog to, Blah-g. Well, only when you post stuff that is boring.